Incredible card! 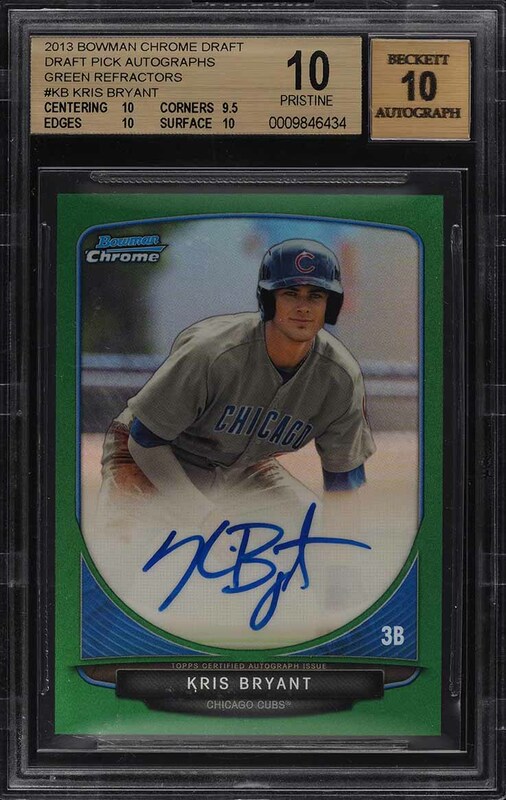 Offered here is a breathtaking '13 Bowman Chrome Green Refractor Kris Bryant rookie card in BGS 10. One of only two confirmed copies to ever reach the illustrious designation, this card ranks among the finest in the world. Looking like it just fell out of a pack, the offered '10' exhibits perfect centering along with uncirculated borders and surfaces. Free of any imperfections with bright color and tremendous clarity. The corners are exceptionally sharp, the edges are ultra crisp and the registration is flawless. In addition, the card comes from an elusive print run of just 75 copies ever produced. Far too rare to ever satisfy the demand. Finally, the autograph has been struck boldly in blue ink and is assessed as pristine. Bryant is widely recognized among the best talents in the MLB and is off to a hot start with a .313 AVG and .625 SLG. 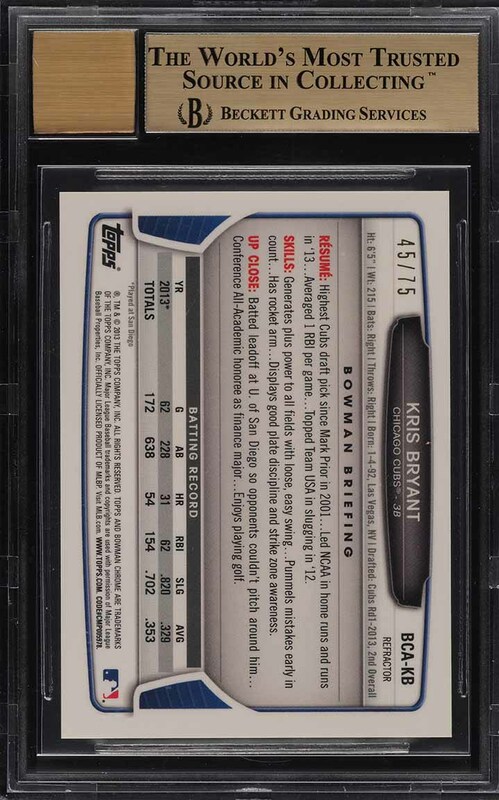 A tremendous investment card which seems poised to a yield a great return as Bryant looks to have a 30+ home run season. Don't miss it. One of nearly 15,000 cards, lots, and sets up for bid in our 4th Auction of 2019. Click on the link above to view the other PWCC auction lots. The PWCC Vault is now live! Open a PWCC Vault account and receive a custom Vault shipping address. Purchases shipped to the Vault receive free shipping and reflect Oregon's 0% sales tax rate.